The NFL has increased its already remarkable attendance levels in the current season to an average of 67,394 fans per match, Sportingintelligence can reveal. 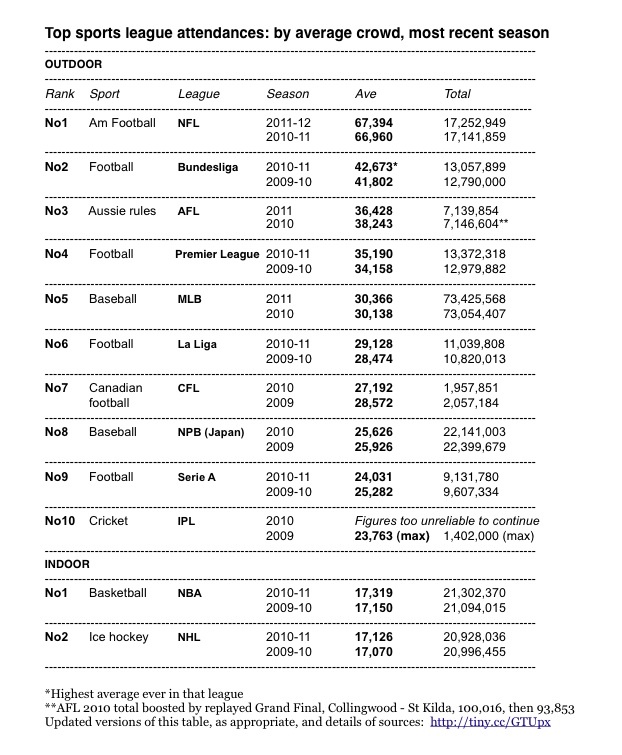 The NFL’s 2011-12 figures show an increase on the 66,960 fans per game that attended in the 2010-11 season. The current season concludes with Sunday’s Super Bowl XLVI, featuring the Patriots against the Giants in Indianapolis. The German Bundesliga’s top division takes the No2 spot, with Australia’s AFL Aussie Rules football in the No3 spot above the English Premier League at No4. The top 10 leagues are shown below, as are the two biggest indoor leagues, the NBA and NHL. Sportingintelligence’s Global Sports Salary Survey in 2011 showed that Premier League players and MLB baseball players also had average annual salaries higher than NFL players. MLB baseball attracts more fans in total per season (more than 73 million in 2011) than any pro league in the world, but fewer on average per game than the NFL.